The conveyor pictured is designed to distribute bulk commodities into dozens of bulk storage bins with staggered inlet openings. Material is received from a bucket elevator, conveyed along the length of the central conveyor, and then elevated and discharged through a tripper and onto a cross belt conveyor. The tripper carriage is self-propelled, and the cross belt conveyor can be indexed left and right to reach the specific bulk storage inlets. 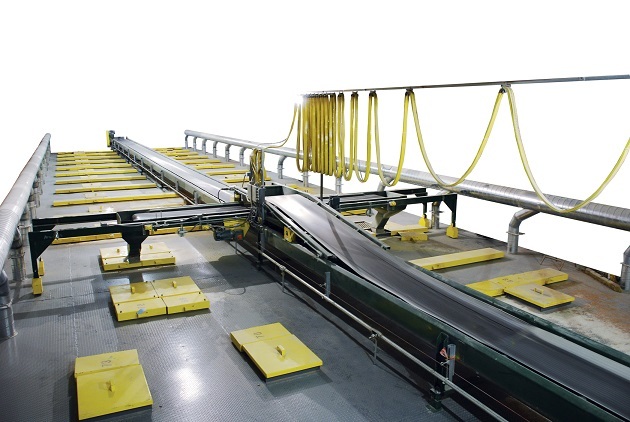 In addition to custom designed equipment, Chantland MHS offers many standard conveyor designs including: flat and troughed, slider and roller bed frames for horizontal and incline applications; corrugated sidewall belts for steep incline applications; and flat wire and powered rollers for bag and pallet applications.